'The Crosses of Lafayette,' planted on an East Bay hillside for U.S. war dead, evoke gratitude, fury and resignation. Reporting from Lafayette, Calif. — As they emerge from a tunnel cut beneath the Berkeley Hills, Bay Area Rapid Transit trains hauling eastbound commuters home from San Francisco enter a landscape of low hills and tight valleys, shaded by oaks and pines and filled with winding blocks of well-maintained houses. It is a pleasant enough slice of California, this cluster of small, leafy communities in Contra Costa County, a place where youth sports dominate weekends and school fundraisers tend to succeed; where one of the latest civic initiatives was a vigorous campaign to persuade motorists to slow down. A few miles down the line, the trains pull in to the elevated station that serves the town of Lafayette. It is at this point that passengers are confronted with a sight that seems jarringly out of place with the pastoral suburban tableau -- a hillside covered with white crosses. There are thousands of them, each about 3 feet high, scattered from the sidewalk of Deer Hill Road to the brow of the low, broad hill. "In Memory of Our Troops," proclaims a large billboard, halfway up the hill. In large block numerals, easily seen by BART passengers and motorists on Highway 24, which runs parallel to the tracks, the sign also keeps count of the number of U.S. service members who have been killed in Iraq and Afghanistan. From the start "The Crosses of Lafayette," as the volunteers who maintain the display call it, has provoked a wide and evolving set of emotions. "It is a shrine for some people, and it is a protest for other people," said Louise Clark, an 83-year-old widow and longtime Lafayette resident who allowed this arresting orchard to be planted on her land. Two years ago, when the project began in earnest, there was outrage from those who saw the effort not only as an antiwar protest but as one that mocked the price paid by U.S. war dead. In one publicized incident, a former U.S. Marine tore down the sign: "My first reaction," she explained, "was 'What a disgrace to those who have sacrificed.' "
Over time, though, these counter-demonstrations died down. The crosses almost seem to have settled into the landscape, attracting a mix of curious passersby, peace activists, veterans of other wars -- some supportive, others upset -- and friends, families and war comrades of the fallen. More than a few families have adopted individual crosses, inscribing on them the names of their deceased and decorating them with photographs, flowers, poems, stuffed animals and other trinkets. Karen Meredith is one. Her only son, Lt. Ken Ballard, a 26-year-old Army tank commander, was killed in 2004. When she heard about the crosses, she recalled, "I was very happy about it, and I could not understand why people would find this offensive. If children are dying in their names, they should understand it and see it every day." None of this is to suggest that the display has won universal acceptance. "A lot of people around here don't like it," said 51-year-old Neil Kelly, "but they put up with it." He and other volunteers, who gather every other Sunday to plant crosses, repair old ones and groom the hill, still endure sporadic taunts and middle-finger salutes from passing motorists. "I can see their point," said Clark, the property owner. "It upsets them to drive by and see all those crosses. Well, it upsets me, too. But that is what happened; it's real. Each cross represents someone who has died over there." The force behind the project is Jeff Heaton, a 55-year-old construction contractor. His parents were close friends of Clark and her husband, who died a year ago. Heaton approached the Clarks in spring 2003, during the early "shock and awe" phase of the Iraq invasion. He received their permission to plant 19 crosses. These were ripped out the first night. He replanted, but with the same result. "I was disheartened," he said. More than three years passed before he was persuaded to try again -- by then, the body count was nearing 3,000. 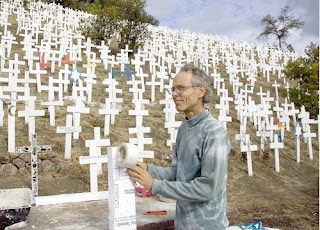 In November 2006, with help from assorted peace organizations, Heaton resumed planting crosses, beginning with an initial batch of about 300. This quickly led to a noisy showdown at City Hall, where opponents of the project failed to persuade the city to step in and abort the project. The city's position was that the crosses were signs and, being less than 4 feet tall, fell under what City Manager Steven B. Falk called "the Realtor's exemption" -- an ordinance meant to facilitate the placement of residential "for sale" signs. "Our entire analysis was content-free," Falk said. That did not translate into controversy-free. After the council's unanimous decision to allow the cross project, City Hall was flooded with protest calls and letters. Falk keeps one tacked to his office wall: "You sir," it proclaims, "are un-American and spit on the real graves of our brave soldiers, who have died to defend your right to make a fool of yourself and bring shame on your city in the process." Such letters, Falk said, have since "tapered off to zero." Heaton, too, took heat early on. He stood toe to toe with a father who objected to his son's name being placed on a cross. After that confrontation, it was decided that names would be posted only when families requested it. Heaton also removed any signs he considered overtly political, including one that proclaimed the hillside to be "Bush's Garden." A soft-spoken man and rail-thin, Heaton chooses words with care as he discusses the crosses. Asked if he considered them a war protest or a memorial to the fallen, he paused a few beats before answering. "It is difficult," he said finally, "to divide that out. I consider it a peace memorial. The point is to sort of in a neutral way show the true impact or effects of the war so that people can work that through in their own way." He said he's not sure how long the crosses will stay up. That will depend, he said, on the course of the war. Even with a new administration to take command shortly, he's not convinced the conflict, especially in Afghanistan, will wind down soon. "This could go on for a very long time," he said. "Unfortunately." As Heaton spoke, volunteers were preparing to plant new crosses made of plastic foam, instead of wood -- an adjustment meant to make the hillside less prone to fire as it grows more congested. A few months ago, the organizers decided to add Afghanistan casualties, creating considerable catch-up work for the cross-makers. "We are about 600 behind," said Craig Cataline, a 54-year-old carpenter. This was a few days after the usual Sunday work party. Cataline had come alone to the hillside to perform a particular chore. The father of a Navy medic who has seen combat in Iraq and whose best friend is represented by one of the crosses, Cataline each week updates the sign's death count, which stood at 4,801. The stocky man followed a well-worn footpath up the hill, carrying a portable screwdriver in one hand and two replacement numerals in the other. As he reached the sign, he stood on the slope and surveyed the forest of crosses. "I originally saw this as a protest," he said, "but in my own mind I didn't want these kids to be forgotten. Whether you believe the war is folly or not, these poor kids gave their lives for America." As he spoke, morning traffic hummed by on Highway 24, and a westbound train pulled into the Lafayette station, loaded with commuters bound for jobs in the city. Cataline extracted several long, wooden screws. He slid out panels that contained a "0" and a "1," replacing them with a "2" and a "4." The number on the sign was now 4,824 -- the total had grown by 23. He reinserted the screws. "That's it," he said. "That's what I do." The task had taken him all of three minutes, but the implications . . .
King is a Times staff writer.